This tea is made from ripe, organic lemons and ginger root that we have slow-dried to capture their intense deliciousness. The oodles of fruity-spice are then blended with manuka honey to give a soothing, sweet finish. 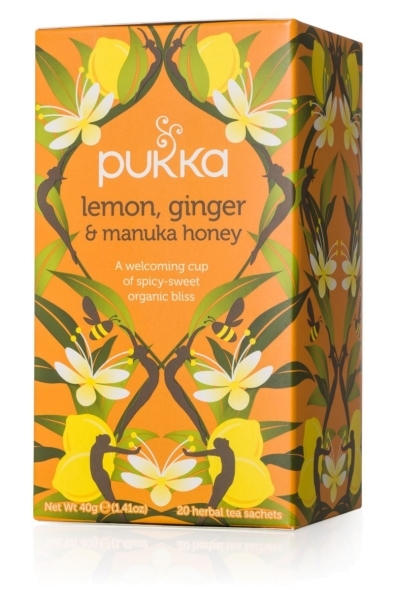 And, as with all Pukka teas, they are naturally organic and totally free from artificial flavourings. Ginger root (32%), licorice root, elderflower, fennel seed, lemon verbena leaf, turmeric root, lemon essential oil, lemon myrtle leaf, whole lemon (4%), manuka honey flavour* (2%). (*contains 0.2% non organic antioxidant: ascorbic acid).